Kerala Plus One First Allotment 2017 Published on 19-06-2017 at www.hscap.kerala.gov.in. Plus one admission based on 1st allotment result 2017 closed on 20-06-2017, 5: 00 PM. 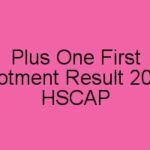 DHSE Kerala Plus One first allotment result 2017 declared on 19-06-2017 at HSCAP website. The candidates can access the 1st allotment result from the web site after declaration of the result. 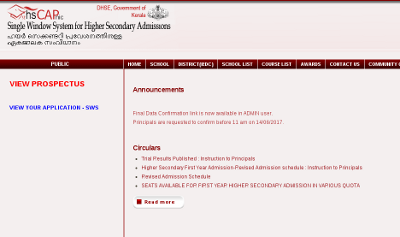 HSCAP 2017 Ekajalakam applied candidates can login to the web site by using their application number and date of birth to check their Plus one first allotment result 2017. All the allotment details like admission dates, allotment option, allotted school etc. will be included in the allotment letter. All the plus one applied students must check the first allotment result from the official web site. Students can follow the below steps to get the allotment result. 4. The allotment result will be displayed in the screen. The candidates who get the allotment should have to download the allotment letter from web site. They must report to the school with the specified fee, allotment letter and original certificates to take HSE plus one admission before 20-06-2017 at 5.00 PM. If they failed to report to the school before the last date and time, they will lose that allotment and will not be considered for any further allotments. If the candidate who are not included in the first allotment, they would wait for the next allotment results published. The candidates who got allotment with lower options, they would take a temporary admission without fee. After published the other main allotments they should take permanent admission with the remittance of required fee.